Ten rounds loaded with 250-grain Speer Deep Curl Gold Dot bullets. The Deep Curls are Gold Dot bullets intended primarily for hunting, though this particular bullet makes a dandy defensive round also, as it has a wide cavity for rapid expansion at normal .45 Colt velocities. The Deep Curls tend to run toward the heavier end of the bullet weight spectrum for any given cartridge. For some cartridges, notably the .41 Remington Magnum, they are the only Gold Dot available and serve equally well for personal protection. 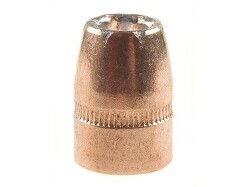 Gold Dot bullets are bonded hollow point bullets manufactured in three basic steps. First the core receives the bonded jacket; next an oversize hollow point cavity is installed with predetermined expansion folds; and lastly the final cavity shape and volume are set for the optimum performance for the cartridge and intended use. The bonded construction provides exceptional weight retention, which promotes penetration. Starline brass cases.